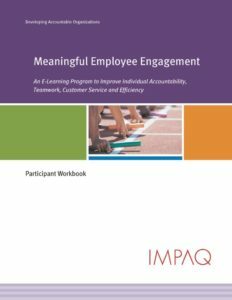 Meaningful Employee Engagement™ (formerly known as Success Through Accountability™), is a simple, practical and easy to apply self-learning system implemented by each manager with his or her respective teams. It is the fastest and least expensive way to increase employee engagement in a way that enhance individual and team accountability for improving customer satisfaction, reducing costs, increasing productivity, improving teamwork. You are guaranteed to get measurable results within seven (7) short lessons; and it happens within your current meeting structure instead of adding down time in facilitator-led workshops.